The so-called Clark Panel report, said to "support" the autopsy report while at the same time disputing several basic medical findings of the autopsy team. The Clark Panel, whose four members were indeed accomplished and respected authorities, were chosen by the Justice Department to review the autopsy evidence in 1968. Their report endorsed the Warren Commission’s central conclusions about a single assassin. However, the Panel did take some key exceptions to the autopsy report’s findings. The panelists’s major contribution to the controversy was that they placed the inshoot of JFK’s fatal wound not ‘just above’ the EOP, as per the autopsy report, but 4 & 1/2 inches higher, a location that was later endorsed by the Rockefeller Commission and the HSCA’s forensic panel. There were four members, William H. Carnes, MD, professor of pathology, University of Utah, Russell S. Fisher, MD, the famed Baltimore medical examiner, Russell H. Morgan, MD, the head of the radiology department at Johns Hopkins University, and Alan R. Moritz, MD, professor of pathology at Case Western Reserve University. Although Nichols may have been right about the reason the Panel’s report was late, the report itself suggests Ramsey Clark may have had other reasons for keeping it out of sight: despite the estimable professional credentials of the panelists, their report is an peculiarly unprofessional product. Had these Justice Department appointees really wished to appear to be acting with, as they put it themselves, “complete and unbiased independence free of preconceived views as to the correctness of the medical conclusions reached in the 1963 Autopsy Report,” they did not promote their cause by couching their phrasing in language better suited to a prosecutor’s brief than to a detached, scientific analysis, especially since they repeated many of the same errors of the original autopsy team, all the while making no few new and substantial errors of their own. The Clark Panel asserted, for example, that both lateral X-rays were “left lateral,” meaning that both were shot with the X-ray beam shooting from the right side toward the left side of JFK’s head, which was placed against the X-ray film. As was apparent to one of the authors when he examined the originals (Aguilar), and as the HSCA’s experts later pointed out, one of the X-rays is left-lateral, the other is right-lateral. 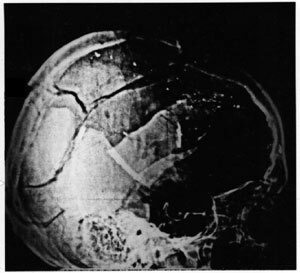 Lateral X-Ray taken during the autopsy of President Kennedy, showing a trail of apparent metal fragments high in the skull. The Clark Panel's declaration that the line described by these fragments "passes through the above-mentioned hole" [i.e, the bullet entrance] is not accurate. The "above-mentioned hole" can be seen as a step-off, or a crack, in the skull at the left side of the skull. Anyone can see that, as the House Select Committee was later to report, the "trail" of fragments is considerably higher than the step-off, ion fact, 4-cm higher, according to the Select Committee. The Panel also said that all of the fragments on the lateral skull X-ray were above “a horizontal plane through the floor of the anterior fossa of the skull,” a horizontal line that is parallel with the EOP and so consistent with the autopsy report’s description of “along a line corresponding with a line joining the above described small occipital wound and the right supra-orbital ridge.” This also missed the mark. The relevance of this issue is that the original autopsy team had cited the trail of bullet fragments as evidence the fatal shot had passed from a low entry point in the rear of JFK’s skull to a high exit point in front, up near the eye. Clark’s experts never acknowledged the fragment trail that had been described in the original autopsy report, one that had wrongly placed the trail much lower than the “correct” trail they identified. Instead, the experts introduced their own mistaken interpretation of the X-ray films, raising the trail’s level to support their theory of where the bullet had entered. But this higher trail was still far too low to be accurate. Only when the HSCA reported out – 10 years later – did it emerge that the actual fragment trail is higher than both the Warren Commission and the Clark Panel had said it was. So only then was it clear that both the original autopsy team and the Clark Panel had misinterpreted important features of the X-rays in a way that allowed them to arrive at quite different conclusions about precisely where the fatal bullet had struck JFK in the head. The actual fragment trail, however, doesn’t help either reconstruction. The Clark Panel also determined that, on the X-rays, no bullet fragments “can be visualized on the left side of (JFK’s) brain and none below a horizontal plane through the floor of the anterior fossa of the skull.” Both portions of this statement are untrue. As Allegheny coroner Cyril Wecht, MD, JD first pointed out, there indeed are fragments on the left side of JFK’s skull, a point confirmed directly by one of the authors who has seen the original X-rays (Aguilar), and also by David Mantik, MD, Ph.D. Moreover, there are fragments lying below the “horizontal plane” of the floor of the anterior fossa on both the left and right sides of the skull. 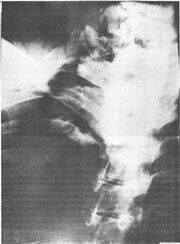 X-Ray of JFK's neck, taken during autopsy. Unfortunately, the quality of this scan (taken from the HSCA's volumes) is too poor to show relevant details. Clark’s experts also reported that JFK’s X-rays revealed that in “the right fronto-parietal region of the skull, the traumatic damage is particularly severe.” This time, the panelists were correct, yet they failed to note an important conflict. The autopsy report described no such frontal damage, but only skull damage to the parietal, temporal and occipital areas. So the autopsy report (and myriad witnesses) specified posterior parietal, temporal and occipital damage, but no frontal damage. By contrast, the Clark Panel concluded the frontal damage was particularly severe, but found nothing to report about occipital injury, not even that the autopsy report had been wrong about the occiput. These discrepancies are hardly negligible forensically. For example, a shot from the right front entering JFK’s skull above, or in front of, JFK’s right ear might easily have delivered a ‘glancing’ blow to the skull as it passed rearward, exiting the right rear. Such a shot would be fully compatible with the X-ray evidence, especially if this was the second of two shots, as first proposed by Josiah Thompson. Yet Thompson’s hypothesis, which as we’ve seen the Attorney General was keen to refute, was ignored a priori by the experts Clark chose. Such a path, incidentally, might also explain the peculiarly high trail of bullet fragments the Warren Report and Clark Panel had misdescribed if in fact such a bullet had been travelling rearward when it struck JFK high in the skull. The forensic implications of this observation derive from how bullets damage skin. When a bullet strikes skin from any direction off the perfectly perpendicular, it tends to create a greater zone of skin scraping and bruising – a so-called “zone of discoloration” or “abrasion collar” – in the direction from which it flew. In other words, if a bullet was shot from a victim’s right side, it would tend to create a larger “zone of discoloration” on the right edge of the wound because that’s the point the bullet hits first, and it tends to stretch the skin more at that point as it goes in at an angle. Similarly, a bullet fired from below tends to leave an abrasion collar toward the bottom of the skin wound. Finally, as Milicent Cranor has astutely observed, the Clark Panel made an important observation that has no factual basis whatsoever: “At the site of and above the tracheotomy incision in the front of the neck, there can be identified the upper half of the circumference of a circular cutaneous wound the appearance of which is characteristic of that of the exit wound of a bullet.” As previously discussed, within a few hours of his death, JFK’s throat wound was describes as looking like an entrance wound by the Dallas doctor who cut into it to perform a tracheotomy precisely because it lacked the features that typify exit wounds. Moreover, none of the experts who subsequently examined JFK’s autopsy photographs have said JFK’s throat wound is typical of exit wounds. To the contrary. As we will see, explanations have been sought to explain why this wound, accepted by officials as an exit wound, looked so much like an entrance wound in its appearance. While space constraints preclude a compilation of every single Clark Panel shortcoming, there is one oversight that deserves mention. The Panel should have proffered a plausible explanation for how JFK’s three “professor pathologists,” actively engaged in teaching “anatomic pathology” to resident physicians in an academic center, could have made so many astounding errors, especially in simple anatomy. A few obvious ones come to mind. Hearings were held in January of 1969 in New Orleans to determine if the U.S. Archivist should be compelled to produce autopsy materials for the Clay Shaw Trial. During this legal battle, the Justice Department made public the Clark Panel report, which had been completed and signed nearly a year earlier but kept hidden at that time. In an anatomic region – the back of the human skull – that measures but 12-cm, top to bottom, how was it that in 1963 two professors of anatomic pathology and a forensic pathologist missed the correct location for JFK’s skull wound by a whopping 10-cm? How had they forgotten to mention that there was frontal bone damage in the autopsy report, damage that is abundantly obvious in what are said to be the original X-rays? How did they find occipital bone damage that, if the Clark Panel is to be believed, was not there? When such images would have been a minimal requirement in photographing the autopsy of even the most undistinguished murder victim, why did they fail to photograph the evidence that proved the nature and direction of the wounding – the internal and external aspects of JFK’s fatal skull wound and bruising at the top of JFK’s lung cage? Finally, the Panel apparently gave little consideration to the possibility the photographic and X-ray inventory was either incomplete, or that it had been tampered with, a possibility that might have suggested itself given the “proven” autopsy errors as well as the obvious absence from the file of images that would normally have been taken to document any killing, even of a President. The Clark Panel’s members included pathologists William H. Carnes, MD, Russell S. Fisher, MD and Alan R. Moritz, MD, as well as radiologist Russell H. Morgan, MD. Their estimable credentials are detailed in the 1968 “PANEL REVIEW OF PHOTOGRAPHS, X-RAY FILMS, DOCUMENTS AND OTHER EVIDENCE PERTAINING TO THE FATAL WOUNDING OF PRESIDENT JOHN F. KENNEDY ON NOVEMBER 22, 1963 IN DALLAS, TEXAS.” In: Weisberg, Harold Weisberg’s Post Mortem, p. 580-581. The Clark Panel's report is also reproduced in ARRB Medical Document #59, see p. 1. Clark Panelist, Russell S. Fisher, MD, specified these dates in a letter to Harold Weisberg dated March 4, 1970 and reproduced in: Weisberg, Harold. Post Mortem. Frederick Maryland: 1975, p. 596. Nichols, John. The Wounding of Governor John Connally of Texas, November 22, 1963. Maryland State Medical Journal, October, 1977, p. 62. Reproduced in: Post Mortem, p. 590. The Clark Panel's report is also reproduced in ARRB Medical Document #59, see p.11. John K. Lattimer. Kennedy and Lincoln. New York: Harcourt Brace Jovanovich, 1980, p. 218. Milicent Cranor. Neck and Torso X-rays: Selectivity in Reporting. Available online at history-matters.com: www.history-matters.com/essays/jfkmed/NeckAndTorsoXrays/NeckAndTorsoXrays.htm. Michael Kurtz. Crime of the Century – The Kennedy Assassination from a Historian’s Perspective. Knoxville: University of Tennessee Press, 1993, p. 98 – 99. See David Mantik’s essay entitled “The JFK Autopsy Materials: Twenty Conclusions after Nine Visits.” In: DiEugenio J., ed. The Assassinations. Los Angeles: Feral House Press, 2003. Clark Panel Report, p. 13. In: Harold Weisberg, Post Mortem, op. cit. p. 592. Memo from David O. Davis, MD, Professor and Chairman, Dept. of Radiology, George Washington University Hospital, to HSCA, 12/22/78. In HSCA, Vol. 7:225. See G. M. McDonnel’s report at HSCA Vol. 7:219. See “Report of the Forensic Pathology Panel,” HSCA Vol. 7:98. Milicent Cranor. Neck and Torso X-rays: Selectivity in Reporting. Lattimer J K. Observations based on a review of the autopsy photographs, X-rays and related materials of the late President John F. Kennedy. Resident and Staff Physician 1972; 18:4 – 63. Lattimer G, Lattimer JK. The Kennedy-Connally One-Bullet Theory. Medical Times 1974; 102, November: 33 – 56. Lattimer JK, Schleshinger EB, Merritt, HH. President Kennedy’s spine hit by first bullet. Bull NY Acad Med 1977; 53:281 – 291. Michael Kurtz. Crime of the Century – The Kennedy Assassination from a Historian’s Perspective. Knoxville: University of Tennessee Press, 1993, p. 99. Josiah Thompson. Six Seconds in Dallas. New York: Bernard Geis Associates for Random House, 1967. Clark Panel Report, p. 9. In: Harold Weisberg, Post Mortem, op. cit. p. 588. Personal communication, Milicent Cranor, New York. New York Times, January 17, 1969, p. 17. Michael Kurtz. Crime of the Century – The Kennedy Assassination from a Historian’s Perspective. Knoxville: University of Tennessee Press, 1993, p. 87.